Hi everybody! Last post I showed you the amazing suede version of Suzi Skis In The Pyrenees from OPI. Because it dries so fast, it's a perfect basecolor for tape manis, such as today's. 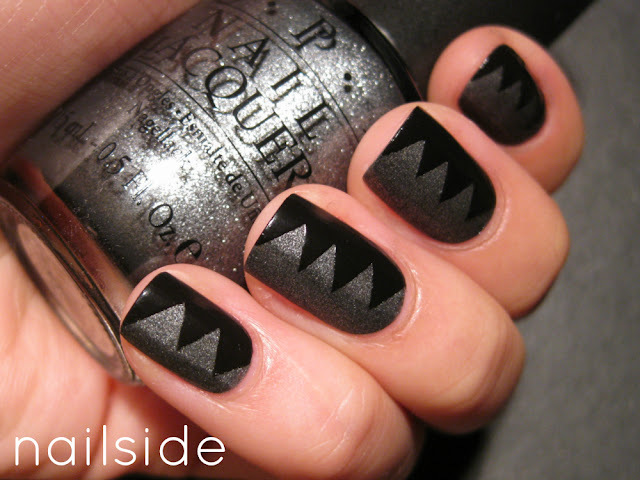 I covered half of my nails with triangle shaped pieces of tape and used my trusty black polish (Where's The Soiree? from Color Club) on top. Then I removed the tape strips and felt like a rock star... Rock on! I love it!!! Especially with these colors! That looks amazing. Very good work! I love this! The contrast of shiny black with the beautiful gray suede and the graphic-ness of the design is awesome. you do the best tape manis! This is awesome, that OPI is a great color! Lovely! Will try something similar! Hey Jane nice one :) can you do a tutorial on this please..
Ye! I love rock! \m/ beautiful combination of colours! This was awesome! Lovely design and the color combination rocked big time! Waw !!! What can I say, I'm discovering your blog today and I'm in love ! You are such an artist. This is full of inspiration to me. It looks like a monsters mouth ♥. Wow, great idea. It looks lovely. The first that passes my mind by seeing this mani is woooow awesome. Need I say more? I think I have to unfollow your blog, your ideas make me so jealous! So beautifull and easy (??) :):) ecpselially with those colours! I just found your blog and I literally spent hours going back through your old posts, your tape manicures amaze and inspire me. Can't wait to try some of your looks.